There is so much more to the concepts of learner motivation and engagement than just keeping people in class or getting learners to class in the first place. 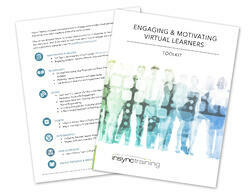 InSync Training has been researching how to engage and motivate virtual learners for over 20 years. And we've never been shy about sharing what we've learned. We've compiled many of our own resources into a toolkit for you to download and use whenever you need it. To download the Engaging and Motivating Virtual Learners Toolkit, complete the form and click on Submit.